Day 5: Preparations for Landing Journal Home Page The First Lunar Landing (ALSJ). Corrected Transcript and Commentary Copyright ©2009 by W. David Woods, Kenneth D. MacTaggart and Frank O'Brien. All rights reserved. 099:31:42 Collins (onboard): It's nice and quiet over here, isn't it? 099:31:56 Collins (onboard): Eagle, you read Columbia? 099:31:58 Aldrin (onboard): Roger. Loud and clear. 099:32:03 Collins (onboard): Okay, everything's going well. Everything's quiet over on this side. 099:32:07 Aldrin (onboard): You bet. 099:32:09 Collins (onboard): Okay. I'm standing by to record your data any time it's convenient for you. Angles coming up in another 2 minutes. 099:32:31 Aldrin (onboard): Okay, I'm ready to go to B Data now. 099:32:35 Collins (onboard): Roger and out. 099:33:00 Aldrin (onboard): Columbia, Eagle. How do you read? 099:33:04 Collins (onboard): Read you loud and clear, Buzz. 099:33:06 Aldrin (onboard): Very good. 099:34:48 Aldrin (onboard): Mike, are you in AGS Cal attitude now? 099:34:54 Collins (onboard): That's affirm. I'm holding you there with the DAP, getting the deadband. When you get ready to do the AGS Cal, I will sort of quiet down the thruster firing and then hope to stop it altogether, but I don't even think that'll get it. 099:35:09 Aldrin (onboard): Okay. Well, I'm just about ready to do that. Whenever you're ready to let it go free, why just tell me. 099:35:40 Collins (onboard): Okay, it looks real quiet now. I'm ready to go right now. 099:36:00 Collins (onboard): Buzz, you copy? 099:36:10 Collins (onboard): Buzz, you copy? 099:36:13 Aldrin (onboard): Okay, Mike. Thanks. 099:36:17 Collins (onboard): Now, [garble] might check me on this, I - it's - I'm ready to go any time you're ready. 099:36:24 Aldrin (onboard): Roger. We'll be ready to go in just a minute. 099:37:46 Aldrin (onboard): Okay, I'm starting my 5-minute rate - right now. 099:40:00 Collins (onboard): As a matter of interest, I appear to be drifting in my roll. I'm holding my pitch and yaw pretty constant, and I'm staying a good 15 degrees late in the program. 099:40:17 Collins (onboard): Looks like a [garble]. 099:40:31 Collins (onboard): Halfway through it, it looks like I have [garble] degrees in roll is about all. 099:40:39 Aldrin (onboard): Yes, those look like good ones right now. 099:41:22 Aldrin (onboard): Mike, what's your Sep time? 099:41:26 Collins (onboard): A few minutes. 099:41:49 Collins (onboard): GET of the separation burn is 100:39:50 even. 099:42:01 Collins (onboard): I haven't gotten the updates for undocking time; I'm still carrying 100 hours 15 minutes, I guess, [garble]. 099:42:23 Collins (onboard): I'm surprised they didn't update it by 3 or 4 minutes to, you know, make that Delta-V be in the same position that they wanted. 099:42:33 Aldrin (onboard): Yes, I agree. 099:42:38 Collins (onboard): So we're about 3 minutes ahead of the printed Flight Plan. It might be wise to try to Sep about 3 minutes early, and we can give them a GET of Sep that's precise, whenever they want it. 099:43:06 Collins (onboard): I have 5 minutes and 15 seconds since we started. Attitude is holding very well. 099:43:21 Aldrin (onboard): Roger, Mike. Just hold it a little bit longer. 099:43:25 Collins (onboard): No sweat, I can hold it all day. Take your sweet time. How's the Czar over there? He's so quiet. 099:43:45 Armstrong (onboard): Just hanging on - and punching. 099:43:49 Collins (onboard): I didn't know [garble] radio. [Garble] I've ever seen a radio. All I can say is, "Beware the revolution." 099:46:21 Collins (onboard): You cats take it easy on the lunar surface. If I hear you huffing and puffing, I'm going to start bitching at you. 099:46:28 Aldrin (onboard): Okay, Mike. 099:46:37 Armstrong (onboard): I just pressurized the DPS. [Garble] looks okay, Mike. 099:46:40 Collins (onboard): Roger that. 099:49:19 Aldrin (onboard): Hey, Mike, can you see where our radar's pointing now? 099:49:29 Collins (onboard): Well, it looks like it's pointed right at my head - that's hard south. So's your radio beacon. 099:49:48 Collins (onboard): Okay. We've wandered back over the bellyband now - let me assure that AGS Cal. 099:50:19 Collins (onboard): How'd the AGS Cal work out? 099:50:23 Aldrin (onboard): Oh, it danced around a little bit, but seemed to go right back to the original numbers. 099:50:33 Collins (onboard): Okay. I'm going to start a maneuver now to our undocking attitude. 099:51:21 Collins (onboard): Now the undock attitude and the SEP attitude ought to be the same, so I'm going to go to what they gave me for the updated separation burn attitude. That's just about 7 degrees off, but it's in your Flight Plan for the undock attitude. 099:53:12 Collins (onboard): When your rendezvous radar self-test is complete, let me know and I'll check out my transponder. 099:53:30 Aldrin (onboard): Excuse me, Mike, what did you say? 099:53:33 Collins (onboard): I say, when your rendezvous radar self-test is complete, let me know and I'll check out my transponder. 099:53:38 Aldrin (onboard): Yes, we're through with that now. 099:53:41 Collins (onboard): Thank you. I'm maneuvering the [garble]. 099:58:44 Collins (onboard): That transponder checked out. I hope they've got a nice, big, strong [garble] for you. 099:58:49 Aldrin (onboard): Very good. 099:59:56 Aldrin (onboard): Hey, Mike, what would you recommend as a good setting on the 16 millimeter? 100:00:02 Collins (onboard): Well, what they recommend for you is f:8 at 1/250th and put it not on infinity, but on 7 feet, which covers all the way from infinity down to a very short distance to keep it in focus, and 6 frames per second, I guess. 100:00:25 Aldrin (onboard): Yes, what you say, f:8 at 1/250th? 100:00:28 Collins (onboard): Yes, f:8 at l/250th. And after you get it all set up, check that f-stop again because it slides and slips off with very little twist. 100:03:53 Collins (onboard): How about using, as an undocking time, 100 hours and 12 minutes? That suit your fancy? 100:03:59 Armstrong (onboard): That'll be fine. 100:04:11 Armstrong (onboard): What have you got for AOS, Mike? 100:04:14 Collins (onboard): I have 100 hours and 16 minutes. 100:10:44 Collins (onboard): We got just about a minute to go. You guys all set? 100:10:48 Armstrong (onboard): Yes, I think we're about ready. 100:11:47 Armstrong (onboard): We're all set when you are, Mike. 100:11:51 Collins (onboard): 15 seconds. 100:12:03 Collins (onboard): Okay, there you go. Beautiful! 100:12:10 Aldrin (onboard): Looks like a good Sep.
100:12:19 Collins (onboard): Looks good to me. 100:12:59 Armstrong (onboard): Okay. I've killed my rate, Mike, so you drift out to the distance you like and then stop your rate. 100:13:13 Armstrong (onboard): Starting my yaw. 100:13:30 Armstrong (onboard): There's sure a better visual in the simulator. 100:13:38 Collins (onboard): Okay. I picked up a little roll. I'm going to get rid of it. PAO: This is Apollo Control at 100 hours, 14 minutes. We're now less than 2 minutes from reacquiring the spacecraft on the thirteenth revolution. When next we hear from them, the Lunar Module should be undocked from the Command and Service Module. We're presently about 25 minutes away from the separation burn which will be performed by Mike Collins in the Command Module to give the LM and the CSM a separation distance at the Descent Orbit Insertion maneuver of about 2 miles. We have some times on the upcoming events. The separation maneuver is scheduled to occur at a Ground Elapsed Time of 100 hours, 39 minutes, 50 seconds; the Descent Orbit Insertion maneuver, which will be performed on the backside of the Moon, set for 101 hours, 36 minutes, 14 seconds; and the beginning of the powered descent at 102 hours, 33 minutes, 4 seconds. We're now 55 seconds from reacquiring Apollo 11 on the thirteenth revolution. During this revolution we will be doing the separation maneuver. We'll also be giving the crew on the Lunar - on the Lunar Module a Go/No-Go for the Descent Orbit Insertion maneuver. We'll stand by now to reacquire the spacecraft. 100:14:22 Armstrong (onboard): Okay with you if I start my pitch, or you think you're not far enough away yet, Mike? 100:14:31 Collins (onboard): I'd prefer you stand by just a couple of seconds, Neil. 100:14:34 Armstrong (onboard): Okay. I'll wait for when you're ready - when you think you've got your rates killed perfectly. 100:14:39 Collins (onboard): Okay. I'm still holding [garble]. 100:15:26 Collins (onboard): Okay, looks pretty good to me now. PAO: We have confirmation of Acquisition Of Signal. We'll stand by for a call to the crew. 100:16:34 Collins (onboard): Just like in the simulator, you're drifting off to one side and down below a little bit. 100:17:06 Collins (onboard): The gear are looking good. I've seen three of them. 100:17:11 Armstrong (onboard): The MESA is not down, right? 100:17:14 Collins (onboard): Say again. 100:17:15 Armstrong (onboard): The MESA's still up? 100:17:21 Unknown speaker (may be a previous utterance): [Garble]. 100:17:49 Collins (onboard): Now, you're looking good. 100:18:01 Armstrong: Roger. Eagle's undocked. 100:18:03 Duke: Roger. How does it look, Neil? 100:18:04 Armstrong: The Eagle has wings. 100:18:20 Aldrin: Okay. You've got it. P00 and Data. 100:18:44 Collins (onboard): It came on. 100:18:56 Collins (onboard): Camera's working beautifully. 100:19:04 Collins (onboard): It's off. 100:20:11 Collins (onboard): I'd have to fire laterally once or twice. 100:20:22 Collins (onboard): Very small. 100:20:28 Aldrin: Go ahead, Houston. Eagle is ready to copy. 100:20:32 Duke: Roger, Eagle. Coming at you with a DOI PAD: 101:36:14.07. Noun 81, minus 00758, plus all balls, plus 00098, plus - correction, 00572, perigee plus 00085 00764 030 000 293. Noun 86, minus 00759, plus all balls, plus 00090. Rest of the PAD is NA. Stand by on your readback. If you are ready to copy the PDI data, I have it for you. Over. 100:22:01 Aldrin: That's affirmative. Go ahead with the PDI. 100:22:05 Duke: Roger. PDI PAD: TIG 102:33:04.36; 09:50, minus 00021; 182, 287, 000; plus 56919. PDI abort, less than 10 minutes, 105:12:30.00. PDI abort, greater than 10 minutes, 103:40:00.00, 107:11:30.00. No PDI plus 12: 102:44:27.00. Noun 81, plus 01223, minus all balls, plus 01889; 01520, plus 00110, 02250. Burn time, 0:46; 000, 190; plus 01187, plus all balls, plus 01911. Noun 11, 103:31:07.00. Noun 37, 105:12:30.00. Ready for your readbacks, Over. [The forms for filling in the PDI PAD are on page 2-37 of the Flight Plan. Here is how the PAD is interpreted. Purpose: The first part of the PAD gives details of the burn that will take the crew to the lunar surface. Time of ignition, TIG: 102 hours, 33 minutes, 4.36 seconds. Time for burn in P63: 9 minutes, 50 seconds estimated. Crossrange: 2.1 nautical miles south. The spacecraft is travelling east to west. This is how far Mission Control believe their flight path will be to the north or south of ideal. The spacecraft's guidance will take this out as part of the burn. Spacecraft attitude at TIG: Roll, 182°; Pitch, 287°; Yaw, 0°. The desired spacecraft attitude is measured relative to the alignment of the guidance platform. In this case the alignment will be per the Landing Site REFSMMAT. Finally there is an entry for the AGS that would be made with the keyboard for this computer, the DEDA (Data Entry and Display Assembly. The value is plus 56919. Next come a series of burns that would be used to return to the Command Module in the event of an abort. First is a PDI abort < 10 minutes. Currently we believe that this means in the first 10 minutes after PDI. TPI (Terminal Phase Initiate): 105 hours, 12 minutes, 30.00 seconds. This is the time of a burn that would lead to an intercept trajectory with the CSM. Now two times for an abort occurring more than 10 minutes into the descent. Time of ignition, TIG: 103 hours, 40 minutes, 0.00 seconds. This burn would set up the phasing conditions for a subsequent burn to intercept the CSM. TPI (Terminal Phase Initiate): 107 hours, 11 minutes, 30.00 seconds. This is the time of a burn that would lead to an intercept trajectory with the CSM. Finally comes a list of data to execute a return to the CSM in the event that the descent is aborted without PDI occurring. Purpose: No-PDI abort burn timed to occur 12 minutes after PDI would have taken place. Time of ignition, TIG: 102 hours, 44 minutes, 27.00 seconds. Change in velocity (Noun 81), fps (m/s): x, +122.3 (+37.3); y, 0; z, +188.9 (+57.6). The change in velocity is resolved into three components expressed relative to the Local Vertical/Local Horizontal frame of reference, in this case, relative to the Moon. HA, expected apocynthion of resulting orbit (Noun 44): 152.0 nautical miles (281.5 km). HP, expected pericynthion of resulting orbit (Noun 44): 11.0 nautical miles (20.4 km). Burn duration or burn time: 46 seconds. Spacecraft attitude at TIG: Roll, 0°; Pitch, 190°. Yaw is not included because it does not affect the pointing of the engine. The desired spacecraft attitude is measured relative to the alignment of the guidance platform. In this case the alignment will be per the Landing Site REFSMMAT. Change in velocity (Noun 86) for the AGS, fps (m/s): x, +118.7 (+36.2); y, 0; z, +191.1 (+58.2). These values are similar to those for the primary guidance system. The difference is perhaps due to the AGS using its own attitude reference. Time of ignition, TIG for CSI burn (Noun 11): 103 hours, 31 minutes, 7.00 seconds. 100:24:39 Duke: Eagle, Houston. We're through with the computer. You can go back to Block. Over. 100:24:46 Aldrin: Roger. Back to Block, and DOI: 101:36:14.07. Minus 0075.8, plus all zeros, plus 0009.8, 0057.2, plus 0008.5, 0076.4, 030, 000, 293; minus 0075.9, plus all zeros, plus 0009.0; NA. Over. 100:25:33 Duke: That was a good readback, Buzz. Go ahead. Over. 100:25:39 Aldrin: Okay, PDI PAD: 102:33:04.36; 09:50; minus 0002.1; 182, 287, 000; plus 56919. PDI less than 10: 105:12:30.00. PDI abort greater than 10: 103:40:00.00, 107:11:30.00. No PDI plus 12 abort: 102:44:37.00; plus 0122.3, minus all zeros, plus 0188.9; 0152.0, plus 0011.0, 0225.0, 0:46; 000, 190; plus 0118.7, plus 0000.0, plus 0191.1; 103:31:07.00; 105:12:30.00. Over. 100:27:24 Duke: Roger. Good readback, Buzz. Out. 100:29:02 Collins: Neil, I'm maneuvering in roll. 100:29:04 Armstrong: Rog. I see you. 100:29:08 Aldrin: Houston, Eagle. Are you copying the fairly large numbers for range and range rate in - Verb 83? And did - did you just give us a state vector that changed one of the two vehicles? Over. 100:29:28 Duke: Roger, Eagle. We gave you a LM state vector. We have not changed the CSM state vector, however. Over. 100:30:16 Duke: Columbia, Houston. On my Mark, 9:30 to ignition. 100:31:03 Armstrong: You want him to go to High Gain, yaw, zero or - say again the numbers. 100:31:13 Duke: Rog, Neil. Yaw 0, pitch minus 20, High Gain angles. Over. 100:31:17 Armstrong: Okay. Yaw zero, pitch minus 20, on the High Gain. 100:31:23 Duke: That's affirmative. We've lost all data with him. 100:31:24 Collins (onboard): Yes, I copy that, and I'll do it just as soon as I get to it. 100:31:27 Armstrong: Okay, he says he'll do that as soon as he gets around there. 100:31:38 Collins (onboard): Okay, Neil, I'm all set for the Sep burn, and we're looking good on this phasing. 100:32:36 Duke: Columbia, Houston. How do you read? 100:32:40 Collins: Columbia reading you loud and clear, Houston. How me? 100:32:43 Duke: Roger, Mike. Five-by. On my mark, 7 minutes 'til ignition. 100:33:47 Duke: Apollo 11, Houston. You are looking good for separation. You are Go for separation, Columbia. Over. 100:36:21 Armstrong: Mike, what's going to be your pitch angle at Sep? 100:36:44 Collins: Is that close enough for you, or do you want it to a couple of decimal places? 100:37:31 Collins: I think you've got a fine looking flying machine there, Eagle, despite the fact you're upside down. 100:37:36 Armstrong: Somebody's upside down. 100:38:56 Collins: There you go. One minute 'til TIG. You guys take care. 100:40:19 Collins: Houston, Columbia. My DSKY is reading 4.9 in X, 5.0 make it, and EMS 105.4. Over. 100:40:32 Duke: Roger. Copy. Columbia, it looks good to us. Over. 100:41:07 Duke: Columbia, Houston. We'd like you to terminate average G. Over. 100:41:16 Collins: Roger. In P00. PAO: This is Apollo Control. That separation maneuver was performed as scheduled, giving the Command Module a Delta-V of about 2.5 feet per second, which should give a separation to the two vehicles of about 1,100 feet at the beginning of the Descent Orbit Insertion maneuver. 100:43:00 Armstrong: You're going right down US-1, Mike. 100:47:20 Collins: Eagle, Columbia. At your convenience, I'd like to switch over to VHF ranging mode. 100:47:29 Aldrin: Roger. Let's go to VHF ranging now. 100:47:58 Collins: Eagle, Columbia. I'm reading you loud and scratchy. Neil is not coming through too well on his VOX. Could you stay quiet for 15 seconds while I get this locked on. 100:49:07 Duke: Eagle, Houston. We've got a state vector for you. We'd like P00 and Data. Over. 100:49:15 Armstrong: You have it. 100:49:29 Duke: Columbia, Houston. We have a CSM rescue PAD if you're ready to copy. Over. 100:49:37 Collins: Ready to copy. 100:49:39 Duke: Rog, Mike. Phasing TIG 103:40:00.00. TPI for PDI less than 10, 105:12:30.00. TPI for PDI greater than 10, 107:11:30.00. Over. 100:50:14 Collins: Roger. TIGs follow: phasing 103:40. PDI less than 10, 105:12:30. More than 10, 107:11:30. Over. 100:50:25 Duke: Good readback. Out. 100:51:08 Aldrin: Roger. Stand by. 100:52:16 Duke: Columbia, Houston. At your convenience we'd like P00 and Accept. We have a couple of state vectors for you. Over. 100:52:24 Collins: Okay. Going to P00 and Accept, and I just got some unexplained roll thruster activity. I might have bumped the hand controller. 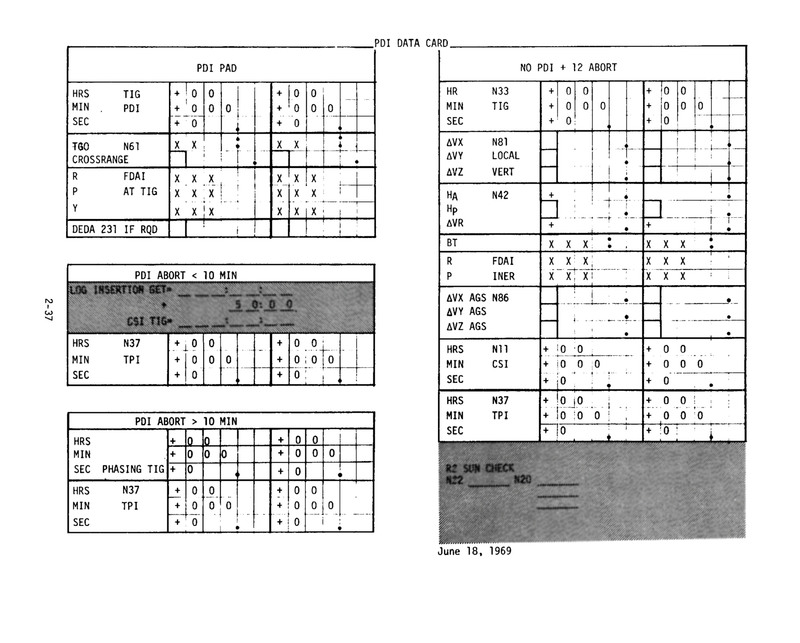 100:52:38 Aldrin: And Eagle is ready to copy lunar surface data card. 100:52:43 Duke: Rog, Buzz. Starting with the T-2; T-2 TIG, 102:54:29.00, 103:51:56.00, 106:37:35.00, 109:10:00.00. In the remarks: T-2 occurs at PDI plus 21:26. T-3 time - correction T-3, T-3 TIG: 104:39:41.00, 001:58:15.00, 001:58:54.00. Noun 11: 105:36:23.00, 107:11:30.00. Ready for your readback. Over. 100:54:20 Aldrin: Roger. T-2: 102:54:29.00, 103:51:56.00, 106:37:35.00, 109:10:00.00; T-2 is PDI plus 21:26. T-3: 104:39:41.00, 001:58:15.00, 001:58:54.00, 105:36:23.00, 107:11:30.00. Over. 100:55:50 Collins: Would you put your tracking light on, please? 100:55:53 Armstrong: It's on, Mike. 100:56:30 Collins: Is that for Columbia? 100:56:32 Duke: That's affirmative, Columbia. 100:56:37 Collins: Okay. Thank you, Houston. 100:58:31 Aldrin: Mike, you want to give us a Mark when you're right at 7 miles - I mean seven-tenths of a mile? 100:58:57 Aldrin: Okay. We just got seven-tenths on the radar. 100:59:00 Collins: Yeah. I'm oscillating between 0.69 and seven-tenths. 100:59:05 Aldrin: Very good. We've got 4,200 on the tapemeter. 101:00:01 Collins: Houston, Apollo - or Houston, Columbia. Over. 101:00:04 Duke: Roger. Go, Columbia. Over. 101:00:08 Collins: Rog. I still need a DOI P76 PAD, and a PDI-1 plus 12 P76 PAD, some time at your convenience. 101:01:05 Duke: Columbia, Houston. DOI P76 PAD, if you're ready to copy. Over. 101:01:13 Collins: Ready to copy. 101:01:14 Duke: Rog, Mike. Noun 80 - correction, Noun 84: minus 00758, plus all zeros, plus 00098; Noun 33: 101:36:14.00, and stand by for the PDI plus 12. 101:01:47 Duke: Columbia, Houston, with the PDI plus 12 Noun 84, if you're ready to copy. 101:01:54 Collins: Ready to copy. 101:01:56 Duke: Roger. Noun 84: plus 0122.3, minus all zeros, plus 0188.9; Noun 33, 102:44:27.00, PDI plus 12 burn time is 0:46, burn time for DOI is 0:30. Ready for your readback. Over. 101:02:40 Collins: Roger. DOI P76: 84 is minus 00758, all balls, plus 00098, at 101:36:14.00; plus 0122.3, minus all balls, plus 0188.9; 102:44:27.00; burn time 46 and 30 seconds. 101:03:09 Duke: Roger. One error, Columbia, on the TIG for DOI; seconds was 14.07. Over. 101:03:37 Duke: Columbia, Houston. We'd like you to turn off your Rotational direct - Rotational Control Power Direct number 2, Off. Over. 101:03:49 Collins: It's Off. Thank you. 101:06:58 Duke: Columbia, Houston. On those P76s, a friendly reminder from your FIDO: add half the burn time to the TIG. Over. PAO: This is Apollo Control. We're coming up on 15 minutes now until Loss Of Signal with the Lunar Module. Flight Director Gene Kranz has just advised his flight controllers to review all of their data, take a good close look at the spacecraft, in preparation for a Go/No-Go decision on the Descent Orbit Insertion. 101:14:09 Duke: Columbia, Houston. We've lost data with Eagle. Will you please have him select aft Omni? Over. 101:14:37 Aldrin: Rog. I got it now. Houston, you reading Eagle now on aft Omni? 101:16:17 Duke: Columbia, Houston. We'll have LOS at 101:28. AOS for you, 102:15. Over. 101:17:07 Duke: Eagle, Houston. It appeared to us when you're doing the P52, maneuvering the S-band, the High Gain went into the stop. Verify that both S-band breakers are in. Over. 101:17:23 Aldrin: Rog. I think I'd got it to 90.0 before it went there. The one on this side is in, and I'll check the other later. 101:17:53 Duke: Eagle, Houston. You are Go for DOI. Over. 101:18:00 Aldrin: Roger. Go for DOI. Do you have LOS and AOS times? 101:18:03 Duke: Roger. For you, LOS at 101:28. AOS, 102:16. Over. 101:18:18 Duke: And, Buzz, S-band steerable update for you on the angles at AOS: 219 and yaw 30. Over. 101:19:08 Collins: Houston, Columbia. How are all the systems looking? 101:19:13 Duke: Say again, Over. 101:19:19 Collins: Just wanted to get a systems check from you sometime prior to LOS. 101:19:46 Armstrong: Houston, Eagle. You - Our torquing angles, Noun 93, on four zeros and a 3 are minus 00292, plus 00289, minus 00094. 101:20:04 Duke: Roger. Copy. Stand by. [Pause.] Roger, Eagle. You can torque it. Over. 101:20:44 Duke: Columbia, Houston. Your systems are looking good going over the hill. About 7 minutes to LOS. 101:22:48 Aldrin: Roger. You got him. 101:23:43 Duke: Eagle, Houston. We've lost the high bit rate. Would you please select low bit rate? Over. 101:23:52 Aldrin: You got it. 101:24:08 Duke: Eagle, Houston. Stand by for my Mark. 101:24:14 Duke: Twelve minutes 'til ignition. 101:25:27 Duke: Columbia/Eagle, Houston. Three minutes to LOS. Both looking good going over the hill. 101:26:54 Aldrin (onboard): Burn time, 30 seconds. PAO: This is Apollo Control. We've had Loss Of Signal now, and the spacecraft Eagle has been given a Go for Descent Orbit Insertion. That maneuver to occur in 7 minutes, 40 seconds; out of contact - out of radio contact, the DOI maneuver scheduled to come at 101 hours, 36 minutes, 14 seconds; and it will be a 76.4-foot-per-second [23.3-metres/second] burn. The burn duration, 29.8 seconds. And the resulting orbit for the LM will be 57.2 by 8.5 nautical miles [105.9 by 15.7 km]. When next we acquire the Lunar Module, it should be at an altitude of about 18 nautical miles [33 km] on its way down to the low point of about 50,000 feet [15,000 metres] from where the powered descent to the lunar surface will begin. As the spacecraft went around the corner, all systems on both vehicles looked very good. Everything is Go here in Mission Control, and aboard the spacecraft for the Descent Orbit Insertion to occur in 6 minutes, 38 seconds. This is Apollo Control, Houston, at 101 hours, 29 minutes. 101:29:01 Armstrong (onboard): Mike, how do you read? 101:29:10 Aldrin (onboard): Columbia, Eagle. How do you read? 101:29:12 Collins (onboard): Very good. How do you read me? 101:29:13 Aldrin (onboard): Very good. If you are ready, give the mark and we'll go to B Data. Over. 101:29:19 Collins (onboard): Stand by one. I'm [garble]. 101:29:22 Aldrin (onboard): Are you [garble]? 101:29:56 Collins (onboard): [Garble]; they look good. 101:29:59 Aldrin (onboard): Okay, let's switch to B Data now. 101:30:25 Collins (onboard): Eagle, Columbia. 101:30:29 Aldrin (onboard): Go ahead. 101:30:31 Collins (onboard): Columbia's [garble]. PAO: This is Apollo Control at 101 hours, 35 minutes. We're now less than one minute from the scheduled time for the Descent Orbit Insertion maneuver, to be performed by the Lunar Module on the back side of the Moon. Of course, we don't have radio contact with the spacecraft. In Mission Control here, where normally maneuvers of that sort would be monitored on plot boards in front; we have the boards set up, but they're for the powered descent to occur about one half rev from now over Landing Site 1. Flight controllers standing around in little groups. Not much that we can do at this point until reacquiring the spacecraft. We're now 20 minutes - or 20 seconds rather - from ignition on the Descent Orbit Insertion. It will be a 29.8-second burn of the 9,800-pound thrust [43.6 kN] Descent Propulsion System. PAO: We should be burning at this time. The result of this maneuver will be to put the spacecraft into an orbit 57.2 by 8.5 nautical miles [105.9 by 15.7 km]. It would remain in that orbit until powered descent. PAO: We should have cut-off by this time. That should have completed Descent Orbit Insertion maneuver. We would expect to reacquire the Command Module first. Command Module acquisition time is 102 hours, 14 minutes, 38 seconds. That will be just about 2 minutes prior to the time that we will have reacquired the Lunar Module. LM acquisition time is 102 hours, 16 minutes, 25 secomds. That is about 37 minutes, 20 seconds from now on, the CSM, and about a little less than 2 minutes longer than that for the LM. At 101 hours, 37 minutes; this is Apollo Control, Houston. 101:37:45 Collins (onboard): Eagle, Columbia. How's it going? 101:37:47 Armstrong (onboard): Mike, the burn's complete. It was on time - residuals are nulled, and AGS's free. 101:42:58 Collins (onboard): Eagle, Columbia. 101:42:59 Aldrin (onboard): Go ahead. 101:43:02 Collins (onboard): Roger. I'm ready to go back to VHF Ranging configuration. Be alright ? 101:43:08 Aldrin (onboard): Roger. Let's go now to VHF Ranging. 101:43:11 Collins (onboard): Over and out. 101:43:24 Aldrin (onboard): And you got Verb 76 in? 101:43:27 Collins (onboard): Yes, 76 is in [garble] locked up. 101:43:47 Collins (onboard): And we're [garble] 7.5 [garble]. 101:43:52 Aldrin (onboard): Roger. That's just what we got, 7.6. 101:44:12 Armstrong (onboard): ...coming up on 8 minutes. 101:44:15 Armstrong (onboard): High Bit, 8 minutes. 101:44:17 Aldrin (onboard): You don't have an 8-minute mark. 101:44:18 Armstrong (onboard): 67 feet per second. Go ahead with the [garble]. 101:44:23 Aldrin (onboard): Can't beat that. Okay, through with that? 101:44:26 Armstrong (onboard): Yes. I like it. 101:44:31 Aldrin (onboard): Hold on to the [garble] below. 101:44:35 Armstrong (onboard): Okay. And I'll pull the breakers - think we can [garble] roll. 101:45:03 Aldrin (onboard): Got them both? 101:45:06 Aldrin (onboard): Got them both? 101:45:34 Aldrin (onboard): Okay, it [garble]. 101:45:42 Armstrong (onboard): Going to load the PDI plus 12, right? 101:45:54 Armstrong (onboard): Okay. I'm going to start pitching down to 125. 101:46:15 Aldrin (onboard): No PDI plus 12. 101:46:34 Collins (onboard): I have you right down [garble] 65 feet per second. 101:46:38 Armstrong (onboard): Sounds good. 101:47:03 Aldrin (onboard): Okay, the camera is set. And ought to be ready to do the P52. 101:47:15 Aldrin (onboard): Not going to be much of a drift check. 101:47:23 Armstrong (onboard): It - it torques them late enough to ensure that - [garble] the drift check. 101:47:32 Aldrin (onboard): Sure seems like we're going the wrong way. 101:47:42 Aldrin (onboard): How much do we got to go to pick it up? 101:47:46 Armstrong (onboard): Got to go - oh, half the Moon to go, I guess. 101:48:05 Armstrong (onboard): Coming down already. 101:48:44 Aldrin (onboard): There's 52. 101:48:54 Armstrong (onboard): Got 8 minutes [garble]. 101:48:59 Aldrin (onboard): Now we can let us take - let it take us there. 101:49:03 Armstrong (onboard): No, wait. Don't do that. 101:49:05 Aldrin (onboard): Why not? 101:49:06 Armstrong (onboard): I have to roll. 101:49:09 Aldrin (onboard): Yes, that's right. 101:49:11 Armstrong (onboard): In 2 more minutes. 101:49:32 Aldrin (onboard): Well, I did [garble] attitude. 101:49:37 Armstrong (onboard): Yes, you'll have to roll over. Well, I guess I might as well do that. 101:49:45 Aldrin (onboard): Where's your watch? Got your stopwatch? 101:49:48 Armstrong (onboard): Got it in my pocket. 101:50:03 Aldrin (onboard): Well, the [garble] us over, huh? 101:50:34 Armstrong (onboard): The map. 101:50:40 Aldrin (onboard): That it? Where do you want it? 101:50:52 Aldrin (onboard): Trade you that for a piece of gum. There it is. 101:51:17 Armstrong (onboard): When do we have to get these? Alright, go on. 101:51:40 Aldrin (onboard): What do you mean by bringing - bringing CSM trash in here? 101:51:42 Armstrong (onboard): Well, that's stuff I had left over in my pocket. 101:53:30 Armstrong (onboard): You want [garble]? 101:53:44 Armstrong (onboard): Screen [garble]. 101:53:53 Armstrong (onboard): You in Auto? 101:53:54 Aldrin (onboard): No, I'm not Auto. I'll be there in just a minute. 101:54:09 Armstrong (onboard): 312, it likes. 101:54:13 Aldrin (onboard): Well, we ought to proceed on that for a while. PAO: This is Apollo Control at 101 hours, 54 minutes. We're now about 20 minutes, 45 seconds from reacquiring the Command Module on the 14th revolution. The time until the ignition for the powered descent is 38 minutes, 55 seconds. Here in Mission Control, people still standing and waiting. I believe back in the viewing room, we probably have one of the largest assemblages of space officials that we've ever seen in one place. Included among the viewers are Dr. Thomas Paine, NASA Administrator; Jim Elms, Director of the Electronic Research Center at Cambridge; Dr. Abe Silverstein, Director of NASA's Lewis Research Center; Rocco Petrone, Director of Launch Operations at Kennedy Space Center is there. From Marshall Space Flight Center, we have Dr. Wernher von Braun, the Director, and his Deputy, Dr. Eberhard Rees. Also a large number of astronauts including Tom Stafford, Gene Cernan, Jim McDivitt and John Glenn. We also see Dr. Kurt Debus, Director of the Kennedy Space Center; and Dr. Edgar Cortright, Director of the Langley Research Center. Dr. Stark Draper, Director of the Massachusetts Institute of Technology Instrumentation Laboratory, is also in the viewing room. Here in the control room proper, down on the floor, a number of astronauts including Pete Conrad, Fred Haise, Jim Lovell, and Bill Anders; and Donald K. Slayton, Director of Flight Crew Operations at the Manned Spacecraft Center. Sitting beside us in the back row of consoles here is Dr. Robert Gilruth, Director of the Manned Spacecraft Center. Further down along the line is General Sam Phillips, Director of the Apollo Program. Also Chris Kraft is here, Director of Flight Operations at the Manned Spacecraft Center; and George Low of the Apollo Spacecraft Program Manager. We also see in the back viewing room, Secretary of the Air Force Seamans, and many others who I'm sure we can't see through the glass. We're now 18 minutes, 10 seconds until reacquisition of the spacecraft. Ignition for the powered descent to the lunar surface is 36 minutes, 30 seconds away. At 101 hours, 57 minutes; this is Apollo Control, Houston. 101:54:27 Aldrin (onboard): These clocks you can't move like you can some. Let me try and get that clock set for PDI. [Garble] 33 [garble]. 101:54:38 Collins (onboard): [Garble] updates [garble]. 101:54:47 Armstrong (onboard): Yes, we're keeping busy down here. 101:56:00 Armstrong (onboard): You can't? 101:56:08 Armstrong (onboard): PGNS Mode Control in Auto. 101:56:34 Armstrong (onboard): Okay. Well, I can [garble] - the radar antenna. 101:56:46 Aldrin (onboard): No, that's the wrong circuit - that's [garble]. 101:56:53 Armstrong (onboard): There's the Sun in the COAS. 101:56:57 Aldrin (onboard): In the COAS? 101:56:59 Armstrong (onboard): In the - I mean, in the reticle. 101:57:02 Aldrin (onboard): Alright, let me - let me do my rain dance with the DSKY here. 101:57:09 Aldrin (onboard): Got it on? 101:57:14 Armstrong (onboard): Now I need a Verb 76. I'm right on in pitch. 101:57:21 Aldrin (onboard): You want a Verb 76? Okay, you got it. 101:57:40 Armstrong (onboard): How are you doing - you going to be about ready to mark? 101:57:55 Aldrin (onboard): Say, how about you remembering the number that I read to you. Don't have to write it down. Roll right just a little. 101:58:08 Armstrong (onboard): Just about ready to mark. 101:58:10 Aldrin (onboard): Go ahead. 101:58:12 Armstrong (onboard): Oh, this cotton picking - thought I was. 101:58:20 Aldrin (onboard): Give me a [garble] check. 101:58:31 Armstrong (onboard): Getting close. 101:58:45 Armstrong (onboard): Mark it. 101:58:46 Aldrin (onboard): 124 19, 124 19. Well, it should have been - 124 00. 101:59:05 Armstrong (onboard): Do another one? 101:59:12 Armstrong (onboard): Okay. I'm about ready. 101:59:21 Aldrin (onboard): Tell me when. 101:59:33 Armstrong (onboard): Mark it. 101:59:34 Aldrin (onboard): Okay. 134 17, Key Release, Proceed. [Garble] it should have been - 124 01. One more. Getting closer. 102:00:18 Aldrin (onboard): Ready whenever you are. 102:00:29 Armstrong (onboard): Stand by. How's our roll? 102:00:43 Armstrong (onboard): Mark it. 102:00:44 Aldrin (onboard): [Garble] - 13; Key Release; Proceed. 413 - [garble] it should have been - closer yet. 102:01:00 Armstrong (onboard): Okay, Mike, we passed the star check. Foxtrot. 102:01:29 Aldrin (onboard): Alright, let's go to - pitch to 180, 285, and zero. 102:01:47 Armstrong (onboard): Okay. We'll [garble]. 102:02:11 Armstrong (onboard): Cotton picker just won't stay - try it! 102:02:16 Aldrin (onboard): Well, wait until we lose that descent stage, man. 102:02:19 Armstrong (onboard): We'd better take - a - piece of tape. Hold that down. 102:02:25 Aldrin (onboard): How about if you get the bottom in the - get the bottom underneath this cover? That help? 102:02:34 Armstrong (onboard): Well, it - it's still not. I've had it in there real good a couple of times. 102:02:42 Aldrin (onboard): Your - hoses were tearing hell out of my board. 102:02:50 Aldrin (onboard): You got Inverter 1 circuit breaker in, right? 102:02:53 Armstrong (onboard): Checked in. 102:02:54 Aldrin (onboard): Okay. I'm going to check Inverter 1. Inverter 2 is good; and Inverter 1 is good, and we're on Inverter. 102:03:05 Armstrong (onboard): [Garble] look good. 102:03:16 Aldrin (onboard): Okay, get your AELD circuit breaker in and Abort Stage circuit breaker in. 102:03:19 Armstrong (onboard): AELD is in. Abort Stage is in. 102:03:24 Aldrin (onboard): Cycle the CWEA? No, we must have lost one. 102:03:28 Armstrong (onboard): Yes. That cocksucker may be trouble. 102:03:35 Aldrin (onboard): Well, we'll have to tell them about that. I don't know when it - when it went out, because we didn't get any light that I saw, did you? 102:03:55 Aldrin (onboard): I don't know. That could have come under DOI, but I doubt it. 102:04:02 Armstrong (onboard): I just think that's one of those sticky flags. [Garble] got a good engine. 102:04:11 Aldrin (onboard): Alright, let's see. 102:04:18 Aldrin (onboard): Engine Stop button was reset? 102:04:24 Armstrong (onboard): Engine Stop button is Start, but it is going to be now. 102:04:31 Aldrin (onboard): Alright. Window bars. Throttle Control to Auto. 102:04:39 Armstrong (onboard): Okay. Throttle Control to Auto. 102:04:44 Armstrong (onboard): Throttle on Minimum. 102:04:56 Armstrong (onboard): That's the wrong time, right? 102:04:57 Aldrin (onboard): No, no, no. 102:04:59 Armstrong (onboard): [Garble]? PDI? 102:05:00 Aldrin (onboard): It's - oh - about - probably maybe a second, right here, [garble] 32. Okay? 102:05:09 Armstrong (onboard): Yes, it's about a second off. 102:05:13 Aldrin (onboard): If it's fast, I'll stop it. If it isn't, why, forget it. 102:05:50 Aldrin (onboard): You want this one over there? 102:05:51 Armstrong (onboard): I need this out. Burn in 46 minutes. 102:05:57 Aldrin (onboard): You want this one? 102:06:00 Armstrong (onboard): Yes. I don't - think - it'll be helpful, but I'll stick it here and pull it out if I need it. 102:06:20 Aldrin (onboard): Let's see. We haven't got P20 going yet, have we? 102:06:24 Aldrin (onboard): Let's do that. Let's get the Rendezvous Radar circuit breaker in. 102:06:34 Aldrin (onboard): In. Might look at the DPS. 102:06:51 Armstrong (onboard): What do you hear? 102:07:00 Aldrin (onboard): [Garble] glycol pumps. 102:07:10 Armstrong (onboard): Look at that. Oh, that must have been - [garble]. 102:07:20 Aldrin (onboard): Okay, ascent - tank pressure - temperature's up, changed to - I don't know. 102:07:30 Aldrin (onboard): Look at all that RCS we got. 102:07:35 Armstrong (onboard): That's more than we've ever had in the simulator, isn't it? 102:07:51 Armstrong (onboard): Got your camera rigged? 102:07:54 Aldrin (onboard): The other circuit breaker? Camera's all set to go. I hope the others just don't fall out. Got them both in? 102:08:17 Aldrin (onboard): Well, let's hope he's in Mode 2. 102:08:33 Aldrin (onboard): Okay, I'm going to get the Ascent Batts, On. Battery 5, On, looks good. Battery 6, On, that's good. 102:09:08 Armstrong (onboard): Yes, we've lost it. 102:09:14 Aldrin (onboard): Well, did it go to Mode 2? That's where I want it to go. 102:09:22 Armstrong (onboard): No - I can't tell. 102:09:26 Aldrin (onboard): Yes, it's going to Mode 2. Hasn't it? 102:09:34 Aldrin (onboard): Yes. There we are. Beautiful. 102:09:38 Armstrong (onboard): Go to Auto Track? 102:10:01 Aldrin (onboard): Hear that, too, huh? 102:10:06 Armstrong (onboard): Sounds like wind whipping around the trees. 102:10:16 Aldrin (onboard): Okay, Auto Track. 102:10:32 Aldrin (onboard): Okay, we ready to go to P63? 102:11:07 Aldrin (onboard): Okay, get a - get a - Need to compare a TIG time. 09:50. That's right. 102:11:25 Armstrong (onboard): See that Big Dipper there? 102:11:27 Aldrin (onboard): That's a big out of plane, but I don't know which way it is. 102:11:33 Armstrong (onboard): I believe minus - but they were expecting it. 102:11:38 Armstrong (onboard): That's within 7 [garble] seconds. Okay? 102:11:53 Aldrin (onboard): Okay. These should not be in Auto, right? 102:11:57 Armstrong (onboard): Yes. Remember that one. PAO: This is Apollo Control at 102 hours, 12 minutes into the flight of Apollo 11. We're now 2 minutes, 53 seconds from reacquiring the spacecraft; 21 minutes, 23 seconds from the beginning of the powered descent to the lunar surface. It's grown quite quiet here in Mission Control. A few moments ago, Flight Director Gene Kranz requested that everyone sit down, get prepared for events that are coming, and he closed with a remark 'Good luck to all of you'. Here in the - on the front of our display boards we have a number of big plot boards which will be used to keep track of the burn progress. Among the more important of those is one which will show the performance of the onboard guidance systems, both the primary and the back-up guidance system, and compare the guidance systems with the Manned Space Flight Network tracking. These displays, by the time this is all over, will look a good deal like a combination of Christmas tree and Fourth of July. We're now 1 minute, 39 seconds from reacquiring the Command Module Columbia. Acquisition of the Lunar Module will come a little less than 2 minutes after that. At the time we acquire the LM it should be at an altitude of about 18 nautical miles, descending toward the 50,000-foot [15,000-metre] pericynthion from which point the powered descent to the lunar surface will be initiated. If for any reason the crew does not like the way things look as they are coming across the pericynthion, simply by not initiating the maneuver they will remain in a safe orbit of 60 miles by 50,000 feet [111 by 15 km], and if they desired they would be able to attempt the powered descent on the following revolution at a Ground Elapsed Time of about 104 hours, 26 minutes. We are now coming up on 30 seconds to acquisition of the Command Module. We'll stand by for that event. 102:12:13 Aldrin (onboard): 180, 287, 0. Here goes. 102:12:47 Armstrong (onboard): You'll get them before we will. 102:12:50 Collins (onboard): Ready to give them a status report? DOI? 102:12:54 Aldrin (onboard): Well, I hope it's on the right page. 102:13:24 Aldrin (onboard): Okay, I'm going to get Descent Quantity, On, [garble] On. 102:14:19 Armstrong (onboard): Okay, you want to give it - Okay, we've lost it. In Auto now. 102:14:42 Aldrin (onboard): [Garble] Range Rate. 102:14:59 Armstrong (onboard): How about that? PAO: Network controller says we have Acquisition Of Signal from the Command Module. 102:15:36 Duke: Columbia, Houston. Over. 102:15:41 Collins: Houston, Columbia. Reading you loud and clear. How me? 102:15:43 Duke: Roger. Five-by, Mike. How did it go? Over. 102:15:49 Collins: Listen, babe. Everything's going just swimmingly. Beautiful. 102:15:52 Duke: Great. We're standing by for Eagle. 102:15:57 Collins: Okay. He's coming along. 102:16:00 Duke: We copy. Out. 102:16:09 Duke: And Columbia, Houston. We expect to lose your High Gain some time during the powered descent. Over. 102:16:19 Collins: Columbia. Roger. You don't much care do you? PAO: We have Acquisition Of Signal from the LM. 102:17:27 Aldrin: Houston, Eagle. How do you read? 102:17:29 Duke: Five-by, Eagle. We're standing by for your burn report. Over.